FA Trophy Final at Wembley Stadium. 'North Ferriby United v Wrexham. 'Ferriby's Danny Hone looks to be held by Wrexham's Manny Smith. '29th March 2015. 'Picture Jonathan Gawthorpe. Danny Hone said it was a “no-brainer” to follow his North Ferriby boss Billy Heath to Halifax. 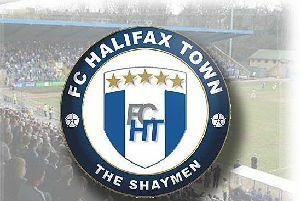 The centre-back is one of six players to have joined The Shaymen from Heath’s former club after earning promotion to the National League last season. The 26-year-old admits the prospect of reuniting with Heath was a factor in his decision to join Town. He said: “I’ve played under him for the last three years. He’s infectious. “He expects the best from you and he doesn’t let standards drop. “Yes he’s approachable but he expects everything and gets the best out of you. “He won’t roll over and let people dictate to him - he will dictate to you, but in the right way. “You want to run through brick walls for him. “When he picks up the phone and wants you to come when you’ve been with him for the last three years, it’s a no-brainer. “The gaffer was a big draw for me. He’s helped me no end. “My career was on a bit of a downward spiral but I haven’t looked back since playing for Billy. Hone started out at Lincoln when he was 11 and played around 100 games there before joining Gainsborough. He signed for North Ferriby in 2013, winning the FA Trophy and gaining promotion from the Conference North, an achievement he believes can be repeated at Halifax. “The club is ambitious and I’m excited by the opportunity,” he said. “For me it was an easy decision. “I know the league and so do all the other lads that have come here from North Ferriby - there’s no reason why we can’t do what we did there last season. “I think the gaffer has brought in the nucleus that worked so well for him last year. “If you look at the spine of the team from last season - obviously I was injured some of time last year - it was mainly the lads who have come here for most of the big games. “They’re big players. We’ve got a really strong squad, we’ve just got to believe. “You don’t want to put too much pressure on yourself and you have to be realistic, but we’re aiming for the play-offs minimum.